I wasn’t able to visit my mother for Mother’s Day, but of course she was in my thoughts as we all honored our mothers and all that they have done for us. It only becomes clearer with time how much they have given and continue to give. 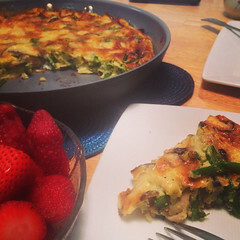 I love to cook because one of my favorite memories of my mother is her willingness to come home and try out new recipes and flavors with us, even when she was working full time. She would come home after sharing lunch with her diverse co-workers and interrupt our usual weekday rotation with novel recipes like salmon hand-rolls and other ideas she would get from her friends. Before kids, she would even send my dad to work with home-made cream puffs. We were all lucky. She does best with what she knows, and what she knows, she does extremely well. And now dad has decided to join the fun and is starting to experiment in the kitchen, too. My sisters blame Food Network and Bobby Flay – I think it’s also a way for him to find a new hobby and give my mother a break in the kitchen. I haven’t been posting much because I’ve been a bit swamped, but that doesn’t mean that I haven’t been in my kitchen. 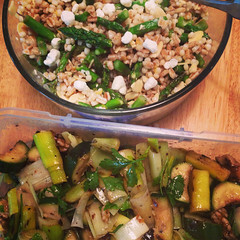 I simply retreat to simple salads and stir-fries. 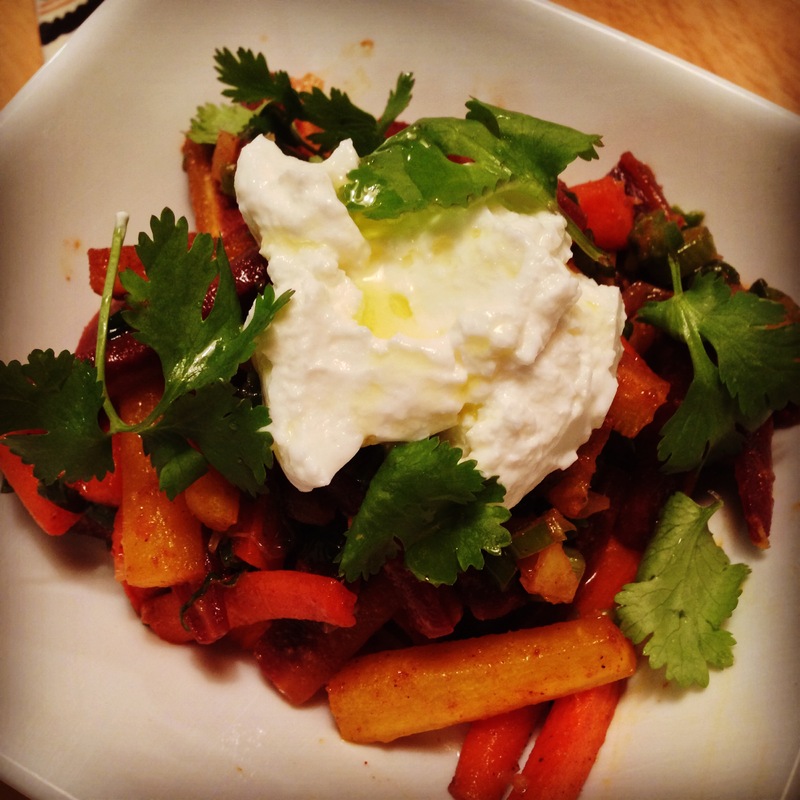 And I try to find ways to simplify prep…like in this salad, a version of Ottolenghi’s Spicy Moroccan carrot salad. I was so excited to find preserved lemon at Trader Joe’s that I had to buy the entire jar to bring home for experimenting (I get excited by little things like this). I decided to post this today because I have recently been obsessed with rainbow carrots. Today, I am reminded that as a little girl, my mom would give me carrot sticks to munch on whenever she shredded them for cooking. And I’d happily snack on them, not simply because she told me ‘they make your eyes bright,’ but because I actually loved the crunchy sweetness. ::shrug:: I was a weird kid with healthy tastes. 2. In a medium bowl, toss together carrot batons, ~1 tbl olive oil, shallots, honey, salt to taste, and spices. 3. Transfer spiced carrot mixture and unpeeled garlic onto a lined cookie sheet and roast until carrots are caramelized and tender-crisp, about 15-20 minutes. Set aside to cool. 3. Squeeze roasted garlic out of their skins, smash, and whisk together w/ lemon juice, 1 tbl olive oil, and chopped preserved lemon. 4. Add the roasted carrots to the lemon-garlic mixture and season with salt to taste. 5. Before serving, stir in the cilantro, taste and adjusting the seasoning as needed. Serve with a dollop of the yogurt and drizzle of olive oil as well as cilantro garnish. 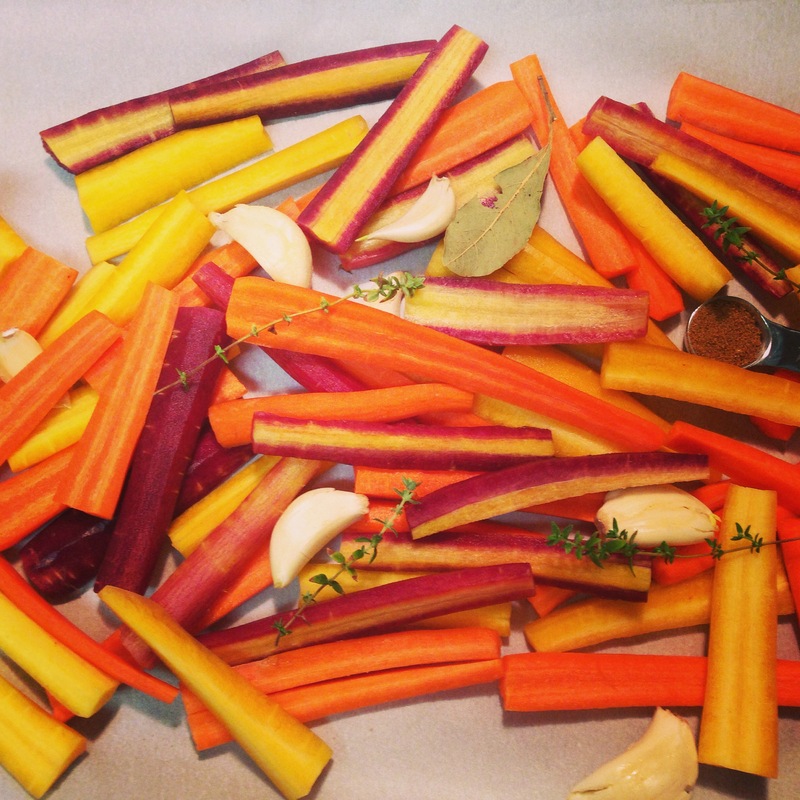 Roasted rainbow carrots with toasted cumin and a blood orange vinaigrette, to be exact! I should have celebrated 3.14.15 (Pi) day with pie, but we somehow didn’t get around to that with all of the other festivities planned for my birthday. Nor did we have cake, which I guess is a little odd but not missed. It was the first birthday J and I were able to celebrate together in the same place, so he took it upon himself to plan it all. Knowing how I’ve missed my friends while in NYC, he somehow managed to gather people from all different phases of my life (college, SF/residency, NYC/fellowship) for fun and food. As it so happens, my college roommate’s birthday is Pi day, so we were able to celebrate with her, too. We were just missing pie! Between dim sum, macarons, wine flights, and late – night tapas, however, there was no time (or calorie deficit) to allow for pie (or cake). 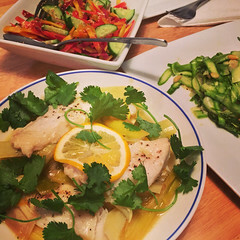 Amidst all the indulgences of the weekend, it was so nice to cleanse the palate with something a little lighter, which somehow bridges the winter-spring transition quite nicely using winter citrus and root vegetables, for perhaps the last time. I’ve always loved having a March birthday – it’s always a month of hope regardless of where you live, as the vestiges of winter are shaken off and spring warmth slowly seeps in. We lose some of that seasonality in CA, but even here you can feel the difference as March roars in but leaves gentle green buds in its wake. 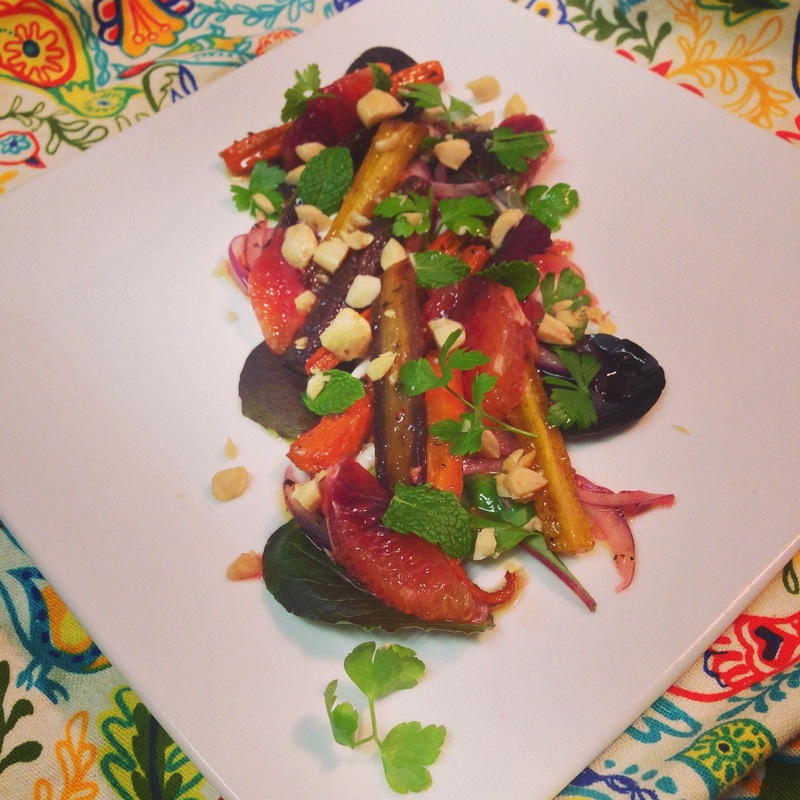 This late winter salad, inspired by Ludo Lefebvre’s Roasted Carrot Salad, surprised J into saying “You may make me into a vegetarian yet.” Carrots are a great source of beta-carotene and vitamin A. Enjoy! Preheat oven to 400. Toast the cumin for both the carrots and the yogurt in a small pan set over medium heat until it becomes aromatic. Remove from heat, and set aside. Mix together the carrots, bay leaf, smashed garlic, thyme and olive oil in a bowl. Sprinkle 1/2 teaspoon cumin over the carrots, and mix again. Tip the carrot mixture onto a sheet pan, and spread evenly into one layer. Season with salt and pepper and place in oven. Roast until the carrots are soft and beginning to caramelize, 30 to 45 minutes. Remove carrots from oven, discard aromatics and set aside to cool. Meanwhile, make the vinaigrette. Combine blood-orange juice, vinegar, sugar and salt in a large mixing bowl, and whisk to incorporate. Slowly add the olive oil while continuing to whisk, until the dressing is emulsified. Add the carrots to the bowl, and toss to combine. Make the cumin crema by combining the nonfat Fage greek yogurt, lemon juice and remaining toasted cumin in a mixing bowl. Stir well to combine. Add a pinch of salt. Assemble the salad on a large serving plate. Put the cumin crema in the center of the plate, and using the back of a spoon, spread it evenly across the bottom. Arrange the carrots on top of the greek yogurt. Sprinkle the onion and the nuts on top of the carrots, then add the supremes of blood orange. Sprinkle the herbs across the top of the salad, and finish with a pinch or two of salt. Make a mess when serving, so that everyone gets plenty of the cumin crema along with the vegetables.